This week on the WineGuyMike™ Radio Show© I’m talking about Rose´ wine, what it is and is not, and things to know when you approach this scintillating “pink” gem when you see it setting there on the shelf. It’s okay to pick this wine up and look at it, even if others are hovering in the wine isle. I say this tongue and cheek of course because it wasn’t so long ago, well at least if you’re my age, that “pink” wine was taboo if you were noted amongst your friends as a serious wine drinker. Well let me share with you that the French have been making beautiful Rose´ for centuries and this beautiful wine has come of age here in the United States and a few of my friends whose wines I’m featuring today have proven it. David Adelsheim, and Sean Minor produce phenomenal Rose wine that I absolutely love. Then there is a little local winery where I live in Missoula that produces a very nice Mourvedre´ rose´ that I enjoyed last week too. Somehow I have sucked into a quest in search of great Rose´ wines. I must tell you that in tasting these wines that are visually beautiful in a wine glass there are many that I just do not like, but when I find one that I love I just can’t get enough of it so to speak. What I find so very interesting about these wines is that they are like a chameleon. They are light and refreshing like a white wine, crisp and acidic like a white wine, BUT once on the palate have subtle nuances of the red wines we love too. Wow, this is fun, interesting, and great to drink and share. I find myself on yet another wine journey that I’m excited to share with you. The following back story excerpt is from a blog post I ran a year ago but wanted to share one more time as it provides an interesting background on the emergence and evolution of pink to blush, to Rose´ in America. An appropriate story for a Memorial Day weekend, a time when I hope we can all raise our glass in recognition of those from the past that have served and protected our country and those who currently are in harm’s way so that you and I can enjoy our glass of Rose´ today. Join me in a toast to say THANK YOU to our service men and women who keep us safe and free, Salute to all of you. In the early 1970’s there was a huge shortage of white grapes for wine making purposes. Winemakers were using red grapes to make white wine. They were incorporating a wine making method called Saignee´ otherwise known as bleeding of the vats. As an analogy think about when you make gravy how the fat and the actual dripping from the meat separate. This also happens in the wine vat, there is a separation of the heavy red must or juice from the light. A winemaker will bleed the light juice out of the vat and in this case in the early 1970’s make a white wine. In the mid 70’s winemaker Bob Trinchero of Sutter Home experienced what is known as a stuck fermentation whereas the yeast dies off before the sugar turns into alcohol in the process of fermentation. Bob wisely set the wine aside and came back to it in a couple of weeks and had what is now known as “White Zinfandel”, it was pink and it was sweet. This discovery made Bob more than a few bucks. In 1976 a wine writer named Jerry Mead visited a winery, Mill Creek Vineyards, in Sonoma California. Charlie Kreck of Mill Creek Vineyards had been one of the first to plant Cabernet Sauvignon grapes in California. Charlie offered Mead a glass of pale pink wine that had no name, but he was not about to call it a “White Cabernet” as it was deeper in color that white wines made from red grapes at the time. The wine was not as dark as the Rose´ wines from that time period. After drinking this pink wine Mead referred to it in a joking manner as “Cabernet Blush”. By night time Mead phoned Kreck and let him know in no uncertain terms that he was very serious about the name he had coined for this pink wine. In 1978 Kreck tradmarked the word “Blush” and it caught on as a name used by Sutter Home, and Beringer. It was a marketing name that became the “Top of Mind” reference for pink semi-sweet wine. The term “Blush” Wine originally referred to a pale-pink wine it now is reserved for a sweet pink wine with a residual sugar of 2.5%. In America most dry pink wines are marketed and sold as a Rose´. In Europe all pink wine is referred to as “Rose´” regardless of residual sugar levels, even imports from America that are semi-sweet. I mentioned earlier in this discussion one of the ways a Rose´ is made by the Saignee´ method, but there are still two more. One is the traditional method of winemaking by which the grapes are left with their skins, in this case just a few days. This method produces wines of a delicate color, pale-pink. The grapes only left for a few days with their skins do not express much in the way of tannin that is found in Red Wines. This wine as a result drinks just like a white wine as is as about food and cheese friendly as a wine can get. The second method is accomplished by adding red wine to a white until the desired color is achieved. This method is generally not acceptable in most regions around the world, for a good reason it is just not the way to San Rose´. Sorry I couldn’t resist, just my poor sense of humor. Rose´ typically is noted to be dry and delicate like the wonderful Anjou Rose from the Loire Valley in France. Rose´ trends now are to use bigger style Rhone Reds, Syrah, Grenache, and Carignan. One of the wines I’m sharing with you today is from Bordeaux and is made from 50% Merlot and 50% Cabernet Sauvignon and is a fantastic Rose´. Sales of Rose´ in France now are greater than White Wine. Winemakers from around the world are now producing Rose´ rather than leave their red wines sitting in barrels unsold. Thank goodness for that for those of us who really enjoy these exciting and delicious wines. Great Rose´ for me is simply elegant, sophisticated, and refined. But here is what I need a wine to be, not over done and not under done. I love a wine that is allowed to be itself, left alone, and not over manipulated. This flight of Rosé that I’m recommending today is well balanced with fruit, acid, and the right percentages of alcohol. They are beautifully understated with nuances of strawberry and cherry and also express wonderful nuances that are particular to themselves. You will experience a perfect crispness and a mellow tartness in these wine that has are lovely and serve up a refreshing mouthfeel. These wines are like a great movie or song you cannot get out of your head, they all deliver a desirable long lasting finish that leaves you absolutely longing for more. Try them, you’ll like them. This 4Bears Vin Gris is produced using the classic saignée method, allowing juice to remain in contact with the Pinot Noir skins for about 24 hours. The juice was then “bled” from the Pinot Noir tank prior to fermentation and set aside on its own in a separate tank. The resulting wine was then fermented dry developing its pink color, aromatics and bright fruit flavors. 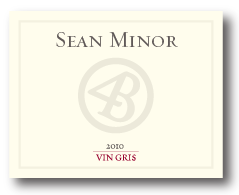 This lovely Vin Gris from 4Bears winery is a bright and vibrant pink color with cherry, strawberry, cranberry and ripe watermelon aromas on the nose. When the wine first hits your palate it displays cherry and strawberry flavors with well recognized flavors of Pinot Noir. Raspberry and cranberry fruit characters are balanced with spicy and crisp acidity that linger creating a refreshing and lengthy finish. The 2010 growing season began after a relatively dry and warm winter (one of the warmest on record). Bud’s on the vines came early as a result in 2010 only to be stalled by cold, rainy conditions, including the wettest June on record. A long, cool growing season ensued and then perfect weather arrived for four weeks at the end of the growing season. This allowed for long hang times to develop the complexity and physiological maturity of the fruit. The Pinot noir grapes for this wine were harvested between October 7th – 22nd. The Berries were small and concentrated, while yields remained low. The 2010 vintage is already being compared to the great 2008 and 1993 vintages in Oregon. This delicious wine offers aromas of fresh strawberries, raspberries, peach, watermelon and a touch of baking spices. The aromas follow through on a rich, well textured palate that offers great intensity and persistence to the finish. Though a perfect summer beverage on its own, this Rosé will pair with all manner of that season’s meals, from bouillabaisse and grilled shrimp, to goat cheese, ham and poultry entrees. The 2010 Château Bonnet Rosé is a blend of 50% Cabernet Sauvignon and 50% Merlot. This wine has a perfect alcohol level of 12.5%. Upon first glance this Rosé looks like a beautiful jewel in the glass, a shimmering gorgeous pink glass. This wine is elegant and beautiful to look at in the glass, more of a very light strawberry color. On the nose the wine presents welcome aromas of white chocolate, ever so mild caramel, strawberry, and mellow cherry. Yes this wine’s aroma is as alluring as it is visually in a glass. Once this beauty hit my palate it danced in my mouth, I don’t want to say it came to life because this wine brought life to my palate. This Rosé is well balanced with fruit, acid, and the perfect percentage of alcohol. It is understated with nuances of strawberry and cherry, also expressing very mild pomegranate. You will experience a perfect crispness and a mellow tartness in this wine that has a lovely and refreshing mouthfeel. This delightful example of Rose´ is available by the glass at the winery. It has been made from 100% Mourvedre´. This wine has very nice color and is also like the other Rose´’s that are visually appealing in the glass. On the nose it has great berry aroma and on the palate there is a lot going on with this wine. You will taste strawberry, cherry, grapefruit, spice, and mild lemon zest. This wine is dry and has a balanced mouthfeel. On the finish there is lingering citrus and berry, I enjoyed this wine by the glass. Missoula Winery offers the wine lover a great experience as they have music events to enjoy at least two evenings a week. The owners Phil and Frenchie are terrific hosts and if you taste wine with sales manager Kevin Van Dort he may even pull out his cigar box guitar and play some of the killer blues he is noted for as a musician. Yep, I had a great time at the Missoula Winery and I recommend you check it out too. This week on the WineGuyMike™ Radio Show© I was fortunate to be able spend a little time talking to one of the wine industries top cult wine heroes, Jayson Woodbridge. Passion has a fuse and every entrepreneur has one. It is interesting to have a conversation with someone like Jayson to find out when his got ignited, and that’s just what I did. 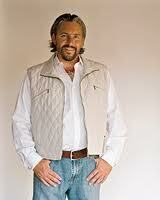 Jayson is a great winemaker, we know that from the wines he has produced and shared with us. I personally think of Jayson as an entrepreneur because of his life, experiences, and his journey into the wine kingdom. Jayson’s work life began in a pizza parlor that his Grandparents owned. As I listened to Jayson telling his story it conjured up fond memories from the Italian neighborhood I grew up in Upstate New York, and yes back then we called it a pizza parlor. A pizza parlor back then was not just a takeout joint. There were actually places to sit so you could hang out with your friends, talk, and eat way to much great pizza. This is the picture that painted my mind as Jayson reminisced about growing up and working with his Grandparents in their establishment. The inspiration to make great wine today comes from Jayson’s past. His Grandparents worked very hard at their pizza parlor as did the customers that frequented their place and as Jayson explained to me that this is where he was struck with his first entrepreneurial epiphany. Just like real-estate location, location, location in the business world if you have a product or service it better have value, value, and more value. Watching his Grandparents work hard, Jayson clearly understood this concept. Every Sunday Jayson’s Grandmother would bake a beautiful Layer Cake and I could tell from the way he described this that he lived for a slice of that cake every week. Here is where the passion candle was lit for Jayson, right on that Layer Cake. When Jayson and his Grandfather would sit around waiting for the Sunday cake they would talk about food and wine. This is when Jayson’s Grandfather shared with him the secret of good wine, that just like Grandma’s Layer Cake with layers of ingredients and goodness so should a great wine be structured. Jayson who obviously has a deep admiration and love for his Grandparents listened and learned and so goes the rest of the story. I was persistent in my efforts to have a Jayson as a guest as I have listened to and watched the way he operates, implements, and executes everything he does. Jayson is originally from Canada and had a very successful career as an investment banker. That entrepreneurial background is serving him well in the career he really loves, winemaker extraordinaire. Jayson is known for his cult hit labels Hundred Acre and Cherry Pie, he began the Layer Cake wine series as a tribute to his grandfather, striving to make affordable wines with a luxurious taste. The Layer Cake name evokes the memory of something comforting, rich and delicious. A unique wine brand with multiple country AVA’s, Layer Cake is handmade in some of Jayson’s favorite wine regions from around the world; he actually makes wine on 4 continents. Each Layer Cake wine is crafted implementing the same small winery techniques and quality standards for which Jayson is well known. Jayson and his winemaking team travel the globe to make all of his wines. They work with small family growers, rigorously selecting only the best fruit. Jayson not only does business with these families but he is friends with them too. He and his team enjoy joy sharing wine, food, and friendship with the families he does business with in faraway places. Harkening back to the conversation Jayson had with his Grandfather he remembered that really good wine should be just like his Grandmother’s delicious layer cake; the layers of soils under the vines produce layers of rich flavors, aromatics, and textures in the wine. Layers of chocolate, mocha, dark berry fruit, and spices found in the Layer Cake wines rival the layers of flavors complimenting his Grandmother’s wonderful layer cake. Jayson also shared with me his recollection of how hard his Grandparents worked and that they could not afford expensive wine. So with his current label, Layer Cake, it was significantly important to him to produce wine that consumers could afford, enjoy, and find extreme value in. And guess what that is exactly what Jayson Woodbridge has done. The current Layer Cake offerings include Shiraz from Australia’s Barossa Valley, a Malbec from Mendoza, Argentina, an old vine Primitivo, aka Zinfandel, from Puglia, Italy, a California Central Coast Chardonnay, and a California Cabernet Sauvignon. These wines are all brilliantly done, a true delight for any person just beginning to discover wine or for the discriminating wine lover. The wines Jayson has made are super approachable in terms of style, quality, and price. Layer Cake wines are equivalent to a fifty dollar bottle that you walk up to the shelf in your market and put in your basket to take home and enjoy for only $15.00 dollars. You have got to love that and you will. Now let’s take a look at these beautiful wines. The Virgin Chardonnay is so named because it never comes in contact with any oak. 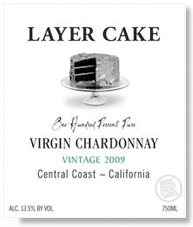 Layer Cake wine lovers have expressed Jayson’s shared interest in getting back to what Chardonnay used to be: Clean, crisp, layered, refreshing fruit, a hint of summer, with none of the overbearing heaviness of oak. The nose is like walking through a blossoming Meyer lemon orchard, a spring stream running over wet cobblestones in the background, and a hint of lemon meringue pie baking inside the cottage nearby. Fresh and vibrant, the wine builds in body and texture as it sits in your mouth. Kaffir lime, guava, pineapple and a note of flint flow in first, then the light creamy texture of lemon curd fills in the flavor palette. The finish is clean and crisp, lingering enough to make you want another sip. The fruit for Layer Cake Malbec comes from a vineyard that is flanking the Mendoza River in Argentina; a rocky terrain, strikingly similar to that of Chateauneuf du Pape in the Rhône Valley. Clay and gravel make up the subsoil under the larger cobble forcing each vine to compete for nutrition; the result is a wine profoundly concentrated and rich, “always rich”. This wine is pure, rich and very elegant; a powerhouse of lush black fruit, silky cocoa, black spice and cream, wrapped around blackberry, cherry and ripe plum. This Malbec is layered and complex with a nose to linger over, a finish that never ends. Sweet anise, hints of tobacco, black chocolate, more cherries and exotic spices, layers of jam. This wine will stand and perform anytime you think of a Cabernet and want something just a little more exotic. Born at the base of the Andes and fed by the purest spring waters. 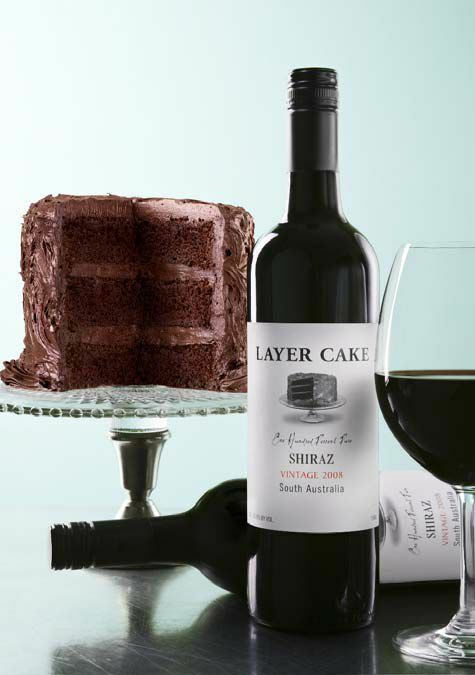 Layer Cake Shiraz is produced in South Australia which is arguably one of the top shiraz-growing regions of the world. Within SA, the McLaren Vale is the most diverse and historic sub-region with vines dating back to the 1830’s. The microclimates within McLaren Vale are what give Layer Cake Shiraz its complexity. For our Shiraz, we pull from vineyards all over McLaren Vale; from the full-clustered, sandy soiled blocks on the sea coast of Gulf St. Vincent, to the Terra Rosa based, tiny-berried wind- blown hills across the Vale. The vineyards are all within a few miles of each other, yet give us a broad array of flavors to blend into a complete wine. This incredible Shiraz is dark, dense and creamy, complex aromas of black plum, Bing cherry, blackberry and pepper merge with licorice, tobacco, mocha and dark chocolate. This is one inky Shiraz; an explosion of dark, super ripe, wild blackberry, with a touch of cigar box finishing with a mélange of exotic spices. A pure fruit bomb…complete from attack through a long, lingering finish. Chefs will save this cake for themselves. The fruit for Layer Cake Primitivo a.k.a. Zinfandel comes from head-trained old vines and is harvested in early September. This is truly remarkable plant material in very old vineyards; some dating to Roman times. The soils in Manduria are red iron-rich clays with large calcareous rocks, shells and coral from ancient sea beds. We’re talking ancient, gnarled baskets hugging the ground and the rocks around them. This Layer Cake wine is a great balance of elegance and power; inky black fruit, spice and white pepper, jammy black cherries, plums, blackberry fruit, truffles, tar, and espresso. Warm and rich in the mouth with a creamy texture; the ripe fruit is well supported by the deep structure of the wine. Sit back and travel through time…Relax on a hot summer evening, the fountain in the background, church-bells in the distance. 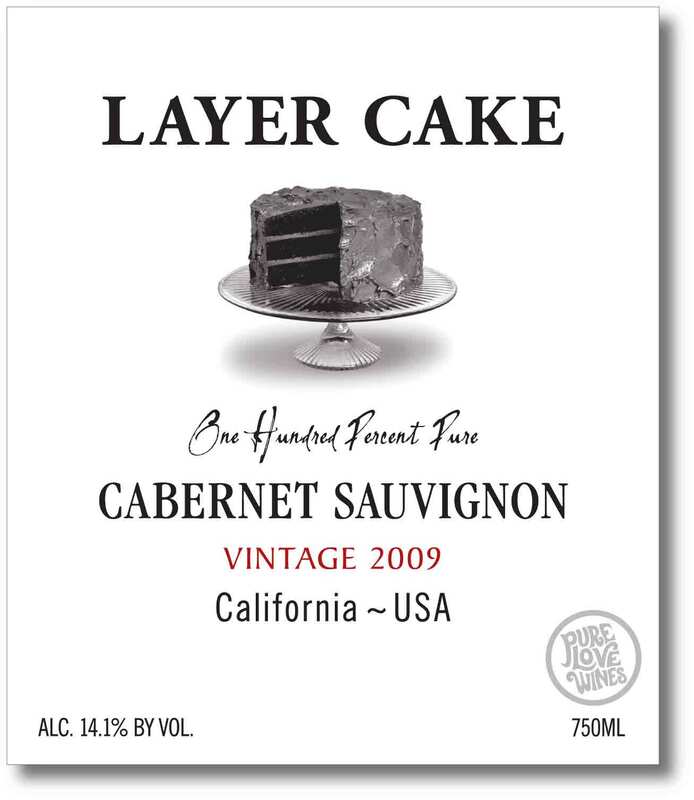 Layer Cake Cabernet Sauvignon was made from select vineyard sites in California combining richness and big fruit flavors with classic structure and tannic power. This wonderful Cabernet was fermented using hand punch downs and gentle pumpovers; then transferring some to French oak for aging. The biggest structured, most powerful lots were put into new French oak for aging to balance the tannins and extract the rich flavors from the barrique. Some lots that would benefit from the softening effect of time in oak were put into French barrels that were used to age. By carefully blending the different lots, varying oak types and different vineyard lots, Jayson has created a balanced and complex wine. This is what is known as a beautiful Layer Cake. This wine is visually beautiful, displaying a deep garnet color in your glass. There are aromas of blackberry, cassis, violets, cedar, tobacco, and hints of minerals and graphite on the nose. This Cabernet is sweet, densely packed and creamy in the mouth, but with firm, underlying structure that gives lift to the dark berry, chocolate, and coffee flavors, yum. Enjoy this very lush, soft, complex wine that coats the palate and spreads out on the long, lingering finish. A special shout out and thanks to Jayson for taking time to join me this week on the WineGuyMike™ Radio Show©. I look forward to sharing a glass of wine Jayson, Salute. Jayson is an amazing winemaker and a person that is a driven talent. You will want to hear what he has to say. I know that I did and I wasn’t disappointed. Tune in Sunday morning at 10:00AM MDT Trail 103.3FM or Fresh 104.5FM. Live stream the show www.Trail1033.com or podcast will be available to listen at your convenience. Check out the radio show on The Trail 103.3FM and Fresh 104.5FM. The live stream feed is online at www.trail1033.com where you can click on “Listen Live”. The WineGuyMike™ Radio Show© airs on both radio stations Sunday mornings at 10:00AM MDT. This week on the WineGuyMike™ Radio Show© I had the pleasure of having a conversation and personal wine tasting with my very special international guest Mr. Guy Sarton Du Jonchay of the Rhône Valley in France. Guy was not born into a winemaking family. He was in fact born into a multinational family. However, his parents came from two of the most wine loving countries in the world, his Father from France and his mother from Argentina. Having studied rural economics and sociology at the National School of Agronomy in Montpellier, France, he chose to follow a further course of study abroad in Argentina. This course of study took him to the winemaking country of Argentina, Mendoza. Here he discovered winemaking, which would become a lifelong passion. Throughout his winemaking career, Guy’s job has led him across the globe to nearly every continent where winemaking can be found. After subsequent degrees in Enology and Viticulture, Guy made wine in the Haut-Médoc, the Languedoc and other French appellations, with Michel Torino and Viña Undurraga in Chile and Argentina and with Rosemount Estate in Australia. He has even provided expertise in a venture to produce wine in the Miyun district in China. From 1995 until 2002 Guy worked for Barton & Guestier as the Senior Winemaker. His duties there included the design of fermentation caves as well as the installation of automated hydraulic grape presses and a streamlined bottling system. He also implemented a state of the art tracking system that enables Barton & Guestier to follow its wines from vineyard to bottle, ensuring the highest quality standards. Guy now brings all of his significant experience and talent to the winery of Vidal-Fleury, where he is Head Winemaker and Managing Director. He is in charge of the 80,000 cases produced there annually. With his background in international winemaking, Guy is sure to bring new best practices as well as fresh ideas to the superlative wines that are produced at Vidal-Fleury. As I have mentioned during a previous show what you experience in a well made bottle of wine is not only wonderful wine but this wine is a direct expression of the personality of the winemaker. You quite literally are drinking their personality; think about that the next time you enjoy a great glass of wine. It is certainly something to ponder. The other thing I want to point out about Guy is his track record. This man is a very special person in the world of wine. Every where he has been and everywhere he goes he elevates wine properties in terms of the wines they produce and the systems and processes he integrates. Guy is a true Renaissance man; he has the unique ability to preserve the incredible Old World wine making technique while employing new methods of process and systems of wine production. This allows these renowned properties to remain viable in today’s so very competitive wine market. I raise my glass to toast Guy and my friends W. J. Deutsch & Sons who import Guy’s wonderful Vidal-Fleury Wines. 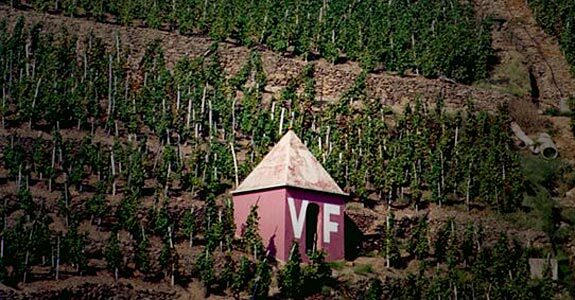 J. Vidal-Fleury was founded in 1781 making it the Rhône Valley’s oldest, continuously operating winery, grower and negociant. Since the beginning Vidal-Fleury has strived to produce a high quality range of wines which show individuality and the typicity of the different Rhone appellations. In the 1980’s Vidal-Fleury as purchased by the Guigal family whom produce amazing wines. The Rhone Valley is one of France’s most important wine growing regions covering a long strip of land from Avignon in the south to Vienne in the north. This area produces more appellation wine than any other part of France, except that of the Bordeaux region. This very diverse region is split into two sections. The north which is a semi-continental environment is dominated by the Syrah grape and prestigious appellations which include Côte-Rôtie, Hermitage and St Joseph. The south has a Mediterranean climate and produces mainly blended wines from varieties such as Grenache, Syrah, Mourvedre and Carignan. Red wines and selected whites are matured in oak casks; a proportion of wines are matured in new oak. This restrained and selective use of oak ensures that the wines are supported and complemented by oak maturation but never dominated. Vidal-Fleury under Guy’s direction has recently completed a major project creating a new cellaring system which provides the company optimum conditions for aging, bottling, storing, and shipping wine. Now let’s get to the important part of this story, the wine, the wine, the wine. It was a real honor for me to sit down and have a conversation with Guy, but what a pleasure to have a personal wine tasting lead by Guy himself. It really doesn’t get any better than that I must tell you. Let’s start with the 2009 Côtes-du- Rhône Blanc which is from the Southern Rhône. This white wine is 100% Viognier which is one of my favorite varietal types. This beautiful example of Viognier fermented and aged in stainless steel which preserves the true bright fruit and crispness in this wine. This vintage was a very warm one in the Southern Rhône which presents certain challenges in the wine making process. Viognier is a very dry, delicate wine with floral aromas and apricot overtones. This wine from Vidal-Fluery does not disappoint, it visually presents as a nice gold color in the glass with a mild nose of fruit, subtle citrus, and beautifully floral. Once this wine hits your palate you will enjoy a nice full, lush mouthfeel. This wine is medium dry with nice balance of fruit and acid. It has great flavor of fruit, a little tropical fruit, a nuance of almond and a beautiful finish. This wine has an impression of subtle sweetness, honey, which comes from this wine being aged on lees. I really enjoyed this wine and recommend it with chicken dishes, a white fish dish, or a Rogue Creamery Blue Cheese. The next wine that I tasted was the 2007 Côtes-du-Rhône rouge and I love red blends from the Rhône. This wine is a blend of 60% Grenache, 30% Syrah, and 10% Mourvedre. This is a very typical blend from the Southern Rhône. The Vidal-Fleury wines all express nice terrior which is what great winemakers strive for. With this blend being predominantly Grenache will get a lot of aroma and flavor of red berries which this wine defiantly delivers. It is very pleasant on the nose with mild smoke, and earth which really speaks to an aspect of the terrior of this beautiful garnet colored wine. On the palate this wine is a nice balance of fruit and acid with really solid structure. This wine expresses a subtle chocolate which is great with the beautiful red berry quality of this wine. You’ll also get some nice white pepper and a little black cherry from this wine. This is a very enjoyable example of a red blend from a well done Southern Rhône blend. This is a wine you will want to try and will really like, there is very good value in this wine. I recommend you try this with grilled red meat, terrific with duck, or one of my favorite cheeses the Smoked Blue from the Rogue Valley Creamery. Last but not least is the gem from the Northern Rhône Saint Joseph appellation, 2007 Côtes-du-Rhône Saint Joseph . This Vidal-Fleury selection was the stand out wine for me going through the tasting with Guy. This region in the Northern Rhône is a Semi-Continental environment which means it is very hot in the day and very cool at night thus perfect growing conditions for the Syrah grape which is all that is allowed to be produced in the Northern Rhône. The nose of this wine is amazing, smoke, earth, dust, dirt, and the best of all BACON, yes I said bacon. Great wines from France as Guy explained to me are a result of two things and they are grapes and time. It made me think of the late Jim Croce and his famous song, “Time In A Bottle”. As great as this wine is on the nose watch out because it is fabulous in the mouth. Beautiful tannin and great full, lush, nutty, spicy, with nice minerality. Guy delivers huge with this fine selection from Vidal-Fleury and did I mention the nice acidity in this wine. Wow you have to try this beautifully made with, this is terrior in your glass and I like to think of this particular wine selection as a real expression of my friend Guy’s personality and I believe it does just that. This wine has it all, great value, great wine to enjoy with red meat, pizza, pork, or the Oregon Blue Cheese from the Rogue Valley Creamery that is is aged in Syrah soaked grape leaves. I recommend this wine, you’re going to love it. Today’s wine selections from Vidal-Fleury and distributed by our friends at W. J. Deutsch & Sons receive the WineGuyMike™ Seal of Approval®. Thanks for joining Mr. Guy Sarton Du Jonchay and WineGuyMike™ this Sunday morning. 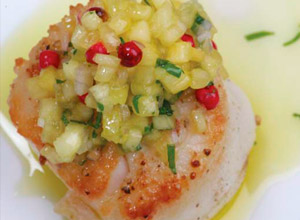 Chef Bob Waggoner talks food and WineGuyMike has two great wines to share with you. Wines for Mothers Day with a couple of terrific recipes to cook for Mom 05_08_2011.